The Gertrudae Rainbow (Pseudomugil gertrudae) known to tropical fish keeping enthusiasts as the Spotted Blue Eye is found in the northern part of Australia and southern Indonesia. The Gertrudea Rainbow prefers living in the shallow, marginal zones of densely vegetated, standing or slow moving waters of creeks, small streams, lakes, billabongs, and swamps in the proximity felled tree branches, tree roots, and other types of submerged wooden structure. They prefer living among cattails, hydrilla, water hyacinth, duckweed or any other type of surface vegetation and are often found in leaf littered substrates. Gertrudae Rainbows (Pseudomugil gertrudae) have a yellow body color with black dotted scales that merge toward the caudal fin into three dotted black stripes. They have bright blue/white fins with black spots and brilliant baby blue eyes. Males are much more colorful than females and have a more distinct body pattern. Adult males also have much longer fins than females. Gertrudae Rainbowfish are a small, peaceful, schooling species that grow to only 1.5″ in length. Pseudomugil gertrudae are similar to the Irian Red Neon Rainbow (Pseudomugil iriani) which has a reddish orange body color with a bright blue stripe running along it’s dorsal edge. When it comes to water chemistry, Pseudomugil gertrudae are incredibly undemanding. They enjoy living in dark brown tannin stained water with very low pH and dissolved nutrients as well as in crystal clear water with a higher pH. They have been collected from waters at temperatures between 53 to 93°F, pH between 3.7 to 9.4, water hardness of 0 to 320 ppm, alkalinity from 2 to 180 ppm, and a conductivity of 12 to 646. However, the Gertrudae Rainbow does best at temperatures between 70°F and 82°F, a pH between 6.0 and 7.5, and water hardness between 0 and 10 degrees. Because of their timid nature and small size, the Gertrudae Rainbow (Pseudomugil gertrudae) is not a good candidate for a community tank setup. They are a shoaling species that should be housed in a single species tank in groups of at least 10 individuals with Caridina and Neocaridina if desired. 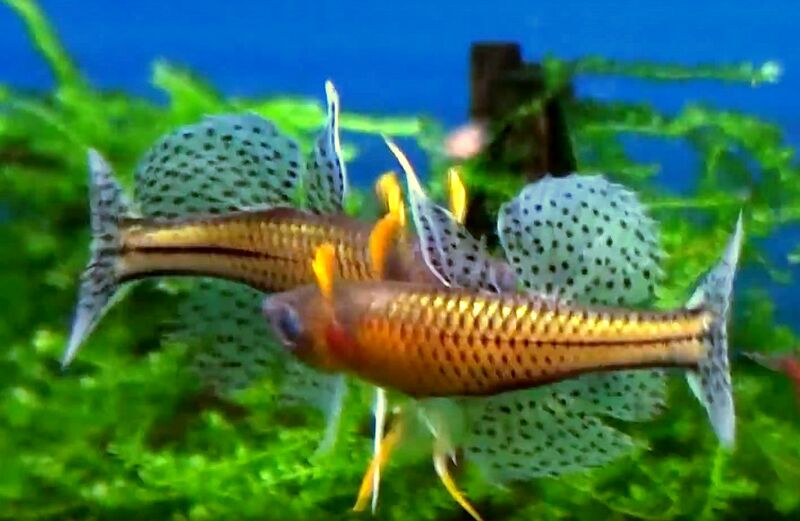 They are best kept in a densely planted, biologically mature aquarium of at least 10 gallon capacity with a sand or fine gravel substrate, some driftwood roots or branches and some floating plants to diffuse overhead lighting. They require well oxygenated water with some current in the tank. Gertrudae Rainbows are egg scatterers that are relatively easy to breed in an aquarium environment. Given the opportunity they will eat their eggs and exhibit no parental care to the eggs or the fry. Spawning normally occurs at higher temperatures during the daylight hours and coincides with the beginning of the rainy season in their range, October thru December. Peak spawning activity is late morning to early afternoon in water temperatures between 75 to 82°F. A single male will mate with several females daily during warmer periods throughout the daylight hours, and spawning can continue throughout the year as long as high water temperatures are maintained in the tank. Females will deposit a few eggs with thin adhesive filaments daily on aquatic vegetation over a period of several days until spawning is completed. The eggs hatch out in approximately 10 days and the fry require microscopic foods like Paramecium for at least 5 or 6 days until they are large enough to accept micro worms, Moria, baby brine shrimp or a commercially prepared powdered fry food . Feed the fry small portions twice a day and provide small water changes by siphoning off any uneaten food in the rearing tank. Unhatched eggs containing developed embryos can be hatched by placing them in a small container with mature aquarium water and shaken vigorously. The rapid change in pressure will usually cause the developed embryos to hatch. 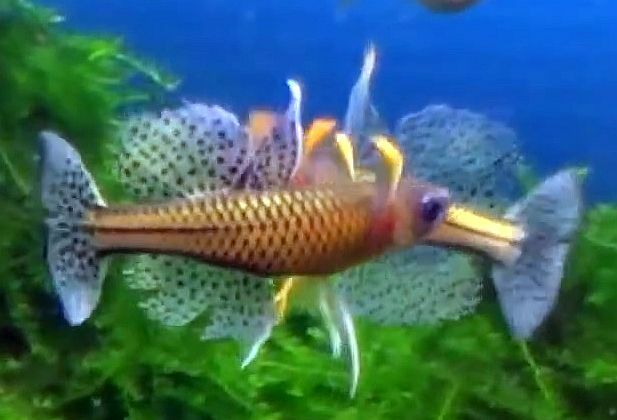 Most commercial breeders will place a single male with two or three females in a breeding tank with a sponge filter and a spawning mop or aquatic moss and remove the spawning medium to a brooding tank for hatching when eggs are observed. The spawning medium should be checked several times a day to maximize the yield. An alternative method is to place a group in a mature, densely planted aquarium with Taxiphylum or Water Hyacinth and letting nature take its course. 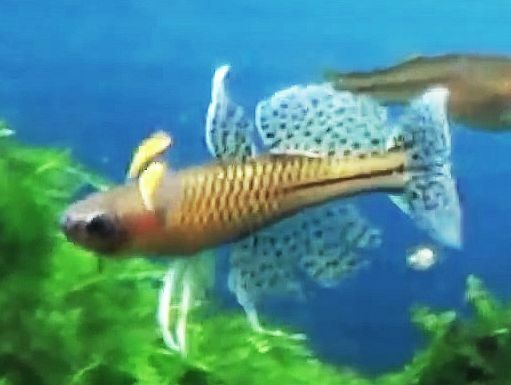 Breeding in a densely planted tank is less productive, but will normally allow some fry to survive on the existing microfauna in the aquarium. In their natural habitat, adult Gertrudae Rainbow feed on zooplankton, phytoplankton and small invertebrates. In an aquarium environment, the majority of their diet should be live Daphnia , Moina , microworms , baby brine shrimp , etc. augmented with a quality crushed flake food. Wild Gertrudae Rainbows are seldom available to tropical fish keeping enthusiasts regardless of origin. Almost all Pseudomugil gertrudae populations available to the hobby are commercially raised in large numbers and can be purchased online and occasionally from specialty fish keeping shops.